Nothing compares to the elegance and ethereal beauty of the harp and its ability to make the most important moments of your life more memorable. The harp adds a unique and enchanting atmosphere to any event that you and your guests will always remember. 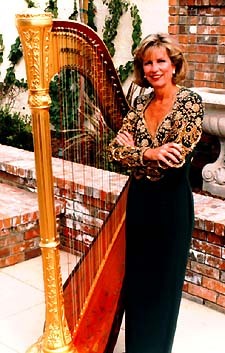 In over 20 years as a professional harpist I have played at the finest locations in Southern California as well as for intimate settings in a back yard or a park. The versatility of the harp takes it to any location, where it creates an enchanting setting for your special day. It is beautiful to listen to and visually beautiful as it is being played. Whether you are planning a wedding ceremony or corporate event, bridal or baby shower, birthday or anniversary celebration, or a celebration of life, the harp can provide just the accompaniment that you are looking for. My professional expertise can be of great help to you in choosing the appropriate music for your event. You can choose from popular songs of today, favorites of yesterday, classical or sacred pieces. All are transformed to shimmering beauty by this exquisite instrument. The harp can be soothing and relaxing, romantic, or joyous and celebratory – the choice is up to you. Fees: Varies, depending on type of event, location,etc. Upon request, I will provide a free demo CD of my music. I will also send a brochure that contains a price list, a list of music that I play, and a little more about what my service includes. My harp can be amplified to accommodate outdoor locations or large rooms and the amplifier is battery powered so there is no need for outlets and extension cords. You may arrange for a free consultation with me during which you can listen to me play various selections and you can choose the music that you want to have for your event. If I am unavailable on your date I will gladly refer you to other excellent harpists in your area.